I know it’s been like a month! But I have been doing really well. I have traveled to New York, LA and just booked a trip to Barcelona in the last month! A high fashion model with runway bookings you may ask? I’m just lucky enough to have a husband that travels for work and I couldn’t pass up the opportunities to check out what the coasts like to wear. I mentioned it before but one of the things I notice most about fashion in NY and LA is the ability to be fearless in their choices. It’s a rule I am trying to live by on a daily basis. Pick something you would not normally wear and don’t look back. I have been having a ton of fun mixing and matching new and existing pieces. I have a shoe collection that I am finally in envy of and I spend wisely and only buy quality pieces that will last years to come. I thought I’d give it a shot and it wouldn’t take long to figure out if it would or wouldn’t work. It costs $10 for a pack of 16. That’s high if you think it claims to last 10 days. That’s a little less than a manicure and there’s no guarantee it is going to work. I bought the color Misbehaved, which depending on the way you look at it, is either reptilish, lacy or even New Orleans ironwork-y on a glittery gold background. Perfect for Halloween or a little Who Dat football! Preparation is key. You want your nails as smooth and clean as possible. No hang nails, pushed back cuticles, you need it to be as flawless as possible to get started. 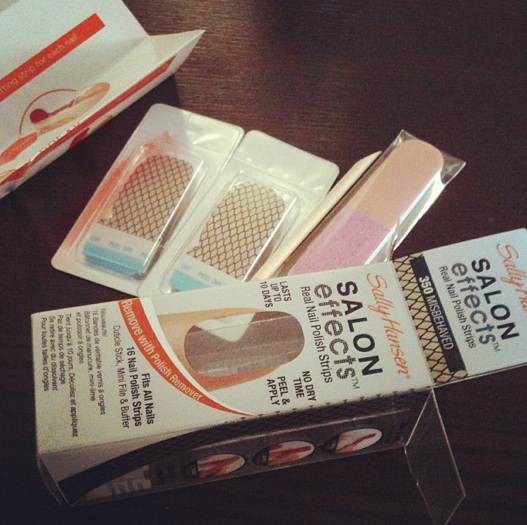 The kit comes with a nail buffer, the little wood stick to push back cuticles, and 16 strips. You apply at the cuticle and just push it down and smooth it out. Once it is smooth and you feel that it’s sticking, you use the handy little file provided and file the excess off. I didn’t think this step would work as well as it did. You can also use the stick to help pull it away from the edge of your nails where it overlaps on your skin. I have really small hands so I was a little worried since the strips are pretty wide. The application is a very slow process!!! Patience is key so set aside some time. I would say the entire process took me about 45 minutes. Part of that has to do with the obvious, that whatever hand you don’t write with is going to be painstaking! The strips are very easy to apply once you get the hang of it. I was concerned it would be really sticky but I did have to pick one back up after I applied it wrong and with a little care, it’s more durable than you think. I really do love them and it came out much better than I expected. I have had them on for a few hours and I was even knitting some hand warmers. They do catch a little bit and one of them has chipped a little. However, I decided to add a clear base Sally Hansen top coat and I can tell that has sealed them a bit. I also know that because I use my right hand much more than my left, it’s going to get beat up a little bit. More to come on the wear and tear over the next few days. Not sure I’ll make it to 10 days but I didn’t think I’d get this far. I’d definitely do this again, but not on a weekly basis. I bet feet would be pretty cute actually!!! (Ah good thought, Christina!) I give it two cute misbehaved thumbs up! I’ll be checking in a little more regularly so thanks for sticking around! Stay tuned. With Halloween on the way, I have purchased a ton of cute new brightly colored stockings thanks to the Spirit pop-up shops all around town. Compared to the $12 that the Hue stockings cost, I have managed to get some hot pink, red and bright kelly green stocking for about $5 a pop. 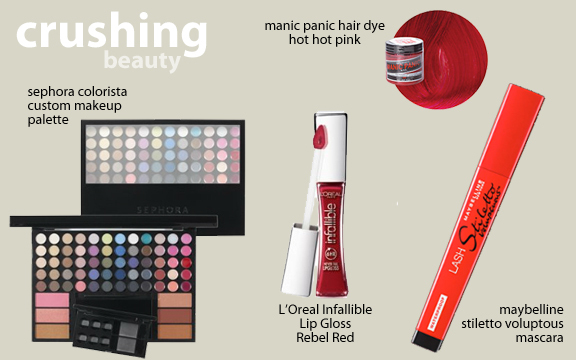 The fearless fashionista in me has some plans to experiment a little this Halloween week! Hello there! It’s Thursday and the challenge of polishing my nails everyday is winding down. My fingertips are a little raw from removing nail polish day after day, but I have experimented a lot and my polishing skills are really clean and I rarely shake anymore! It also has me thinking about some future challenges, like heels for a week (still thinking about this one), different colored stockings for a week, a dress a day! so many options. It will help me break out of my jeans everyday challenge that I’ve been doing for years! Let me share with you my latest polish. Probably not something I would want to wear an entire week, but that’s the fun of the challenge. I also wanted to see what jewel tones I had in my collection. Last year, my enabler sweet husband gave me just about every bottle of Maybelline’s Express Finish line. I love them, but the shiny colors make it difficult to apply and they often come out streaky and clumpy. Whenever I would go get a professional manicure, I would get these shiny opalescent colors and would ask what the secret is to applying them. The key is to keep the brush as thin as possible and paint two coats. It takes practice but I finally have the hang of it. Today I’m wearing Maybelline’s Express Finish in Timely Turquoise and it screamed ‘Give me some Glitter! !’ so I added a few sparkles with the Wet N Wild Party of Five Glitters that I sported earlier this week. It’s very Tron-like! haha. Stay tuned. Another big affordable retailer is pairing up with a fashion giant! More news to come. Have we recovered from a crazy shopping day yesterday? I explained the Target Missoni shopping experience to my husband last night and when I told him that items are selling at crazy high prices on ebay, I swear I saw dollar signs flash in his eyes. I even thought about taking all the items with me to work today, just to be safe. I am wearing my fab velour hoodie today and I do love it! 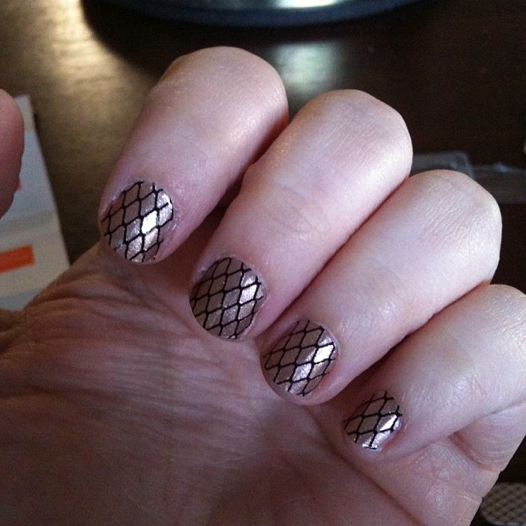 Nail Polish-A-Day Challenge: Day 4: I’m sporting a new polish today that I absolutely love! I will say, this has been quite a challenge to paint my nails day after day but it’s also been lots of fun and I feel myself becoming better and better at applying polish. Today’s color comes from Banana Republic. I shopped at the Banana Republic Factory store in Myrtle Beach over Labor Day weekend and it was a total impulse buy at the counter. 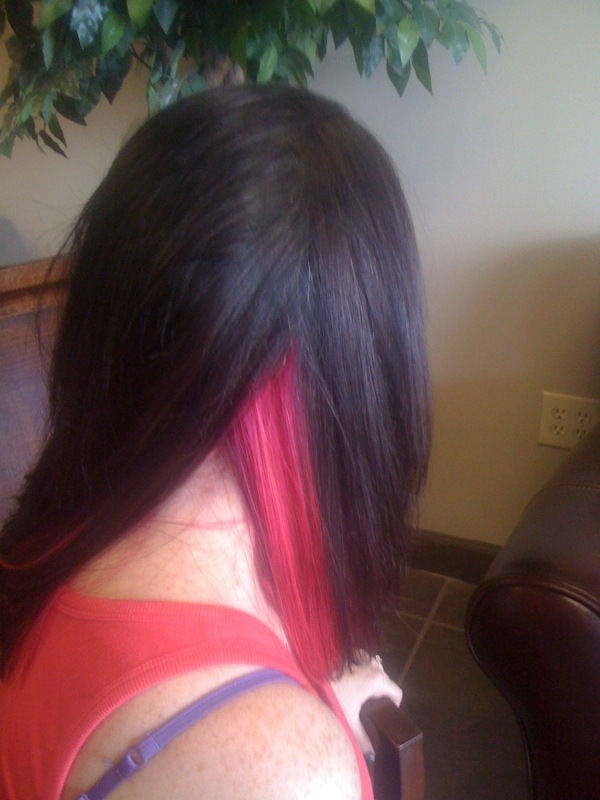 Boy am I glad that I had an impulse that day. This has become my new favorite shade. The bottles are also really small and the small nail brush makes it really easy to apply to the corners without painting your whole finger. Check it out in Orchid Blossom. My only hangup is that I believe these are exclusive to the factory stores. I don’t see them for sale anywhere online! Too bad because I would have bought a few bottles. Monday morning! I’d love to say that I got up at 630 and crawled myself down the street to the gym, but I did not! It is so hard to get up when it gets darker outside. I promise I am going tomorrow morning though. I plan to sleep in my gym clothes. I wasn’t totally unproductive though! 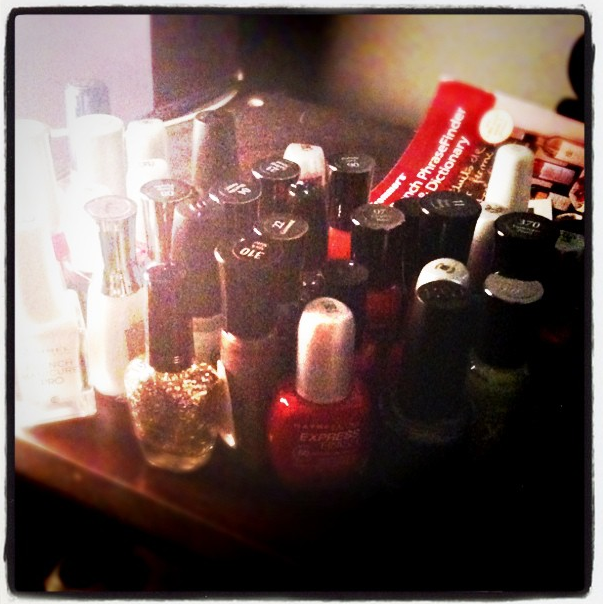 I painted my nails for the second installment of the Nail Polish-A-Day Challenge. While yesterday was glittery and gold, today is a bit more somber. It’s MONDAY! Need more coffee. I chose to use two colors. I painted a base coat of Sally Hansen’s Insta-Dri in Uptempo Plum. I love these Insta-Dri polishes. The brush is angled and it really does dry almost instantly. Plus they are extremely affordable! I painted a few glittery sparkles on top with Wet n Wild’s Party of Five Glitters. I love all these new glittery shades, even if they are really difficult to remove. They take a little practice too. Instead of painting them right on, I let the brush drip the glitter on top. It looks like confetti. Already thinking about what to wear for Tuesday. 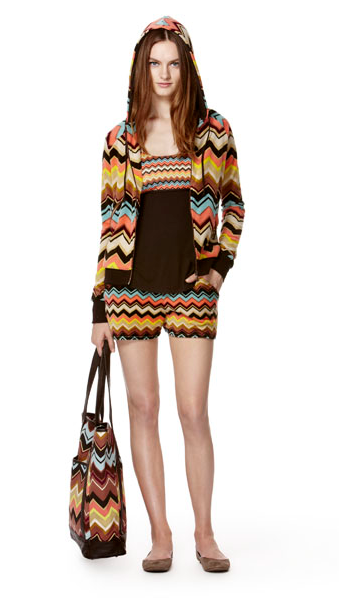 I guarantee it will tie in with a big lunchtime shopping spree over to Target for the Missoni unveiling! Click on the image below for the entire lookbook. 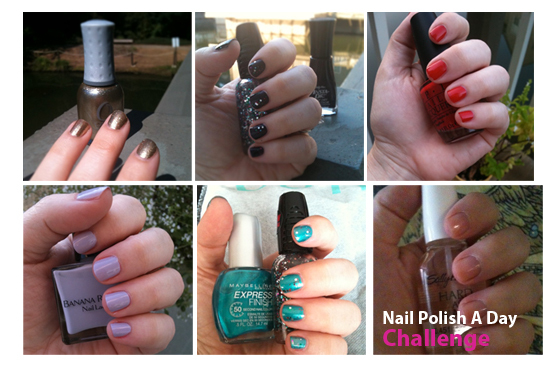 Nail Polish Challenge – Are You With ME? Nail Polish. 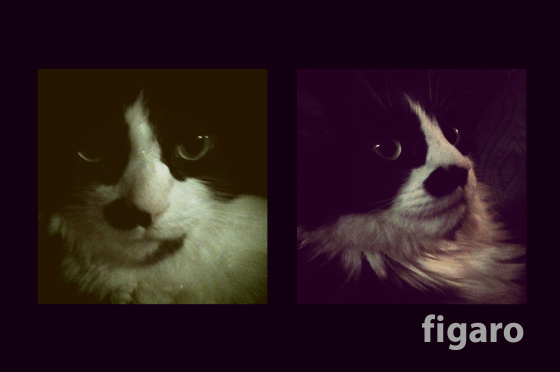 I love it almost as much as my cat Figaro! Look at that face! He was a member of royalty in a former life! I’m convinced. Beginning tomorrow, Sunday, I’ll do one manicure a day and share it with you and I’d love for you to join in and post with me. It will take a little bit of willpower, but we can do it! Be sure to post the bottle too! I love finding new shades! Here’s an unofficial photo to get you inspired. China Glaze’s Refreshmint. Super clean and glossy! 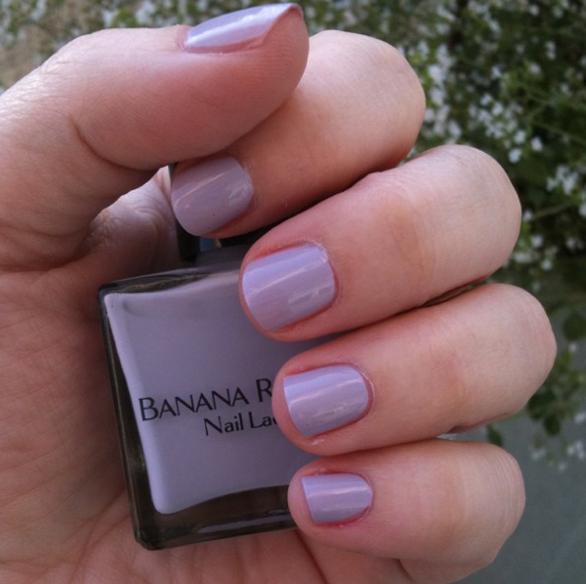 And I LOVE this color! Makes me want to sip on something minty! I love glitter! What girl doesn’t?? I’d even suspect guys like it too! One of my favorite albums to listen to is Tom Waits, Glitter and Doom Live. Could it be because it’s got the word glitter in the title and I imagine he’s singing in front of a gold glitter curtain in a smoky jazz hall? Don’t worry you are in the right place. I love when trends involve glitter. I’ve been sporting blue glitter nails since my Catholic High School days when it was considered shocking and a bit gothic! I carried a black glittery purse on a string in 1995 and put my Marilyn Manson ticket stubs in it. But in the last few years, glitter has become more acceptable to wear on a daily basis and I’m thrilled!! 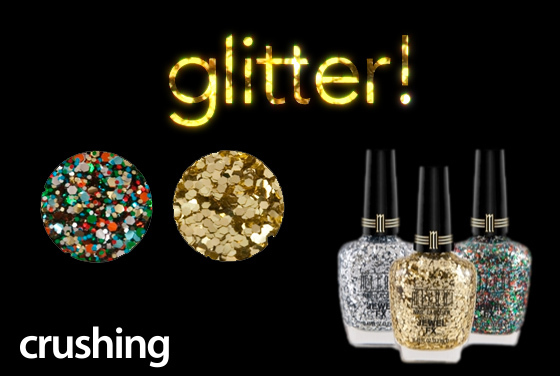 No longer do you need Halloween or Mardi Gras as an excuse to wear glitter. I visited the grocery on the way to work this morning to pick up some lunch but instead my eyes wandered elsewhere. Standing in front of me were two of the most beautiful shades of nail polish I’ve ever seen! It’s like it called me out of the aisles and said, ‘look how pretty we’d look together?’ Being a girl that is trying to stick to a budget, I did not buy them, but it did inspire me to make a beautiful little crushing graphic! Have a look and see! So looking forward to the coming months where I know I’ll be looking shiny and sparkly!!! Have a great day!